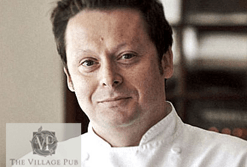 Did you know that Chef Dmitry Elperin, The Village Pub, Woodside, CA, spent his childhood in Minsk before moving to Madison, WI when he was nine years old? Or that his introduction to cooking began early, in the family’s Belarus garden and kitchen of his Grandfather in Russia? The Village Pub in Woodside is one of my personal favorites and I enjoy all that Executive Chef Dmitry Elperin brings to it. So I thought a few highlights of his career and food philosophy would make a great follow-up piece. Dmitry Elperin was still in his teens as he came up the ropes in the restaurant kitchens of his youth. Once he graduated from the Culinary Institute of America (New York), an abundance of opportunities opened for him. Before coming to California, he learned a great deal from his four years at Red Sage, working for Chef Mark Miller in Washington D.C. Once in the Bay Area, he began to broaden his repertoire. Added to the Southwestern cuisine gleaned from Chef Miller, was classical French cuisine via Sans Souci in Carmel, CA. Asian fusion was next as he continued on his culinary quest at Hawthorne Lane in San Francisco. Chef Dmitry left his heart in San Francisco. While he did go back East Coast for a time to work for Chef Daniel Boulud, according to his bio at The Village Pub website, Dmitry says, “I got spoiled in San Francisco, and I came back to the city I love.” We are fortunate for that indeed! Many acclaimed San Francisco restaurants have benefited from Dmitry’s touch and he has worked with some of the city’s most talented chefs at several favorite haunts, including Adrian Hoffman (One Market Restaurant) – Daniel Humm (Campton Place) – Laurent Manrique (Aqua). A bit of back-story: In 2001, Tim Stannard, Mark Sullivan, and Andrew Green had a vision to offer diners a fresh and relaxing dining experience to exceed the expected, all in a very unexpected spot in the heart the quaint hillside community of Woodside, CA. They were looking to create an inviting space where innovative cuisine was the norm and the finest local, seasonal, sustainable, organic ingredients were always at hand. As the story goes, it was a chance meeting with Mark Sullivan (then executive chef or The Village Pub) in New York City that prompted Dmitry’s next move. 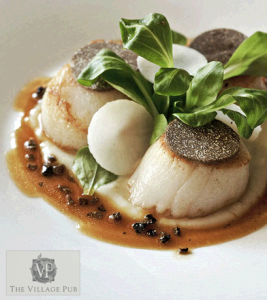 In his time at The Village Pub, Chef Dmitry has seen several consecutive one-star awards from Michelin to complement their Wine Spectator “Grand Award” – You can see why this gem of a pub, just south of San Francisco and tucked away in the woods of Woodside, is a favorite of mine. I hope you will stop in and enjoy! In case you missed my take on The Village Pub itself, simply click here to read the article. Photo Credit: A special thank you to The Village Pub for the use of their wonderful photo of Executive Chef, Dmitry Elperin. Reservations: Reservations are recommended – Please call 650-851-9888 or online via Open Table.